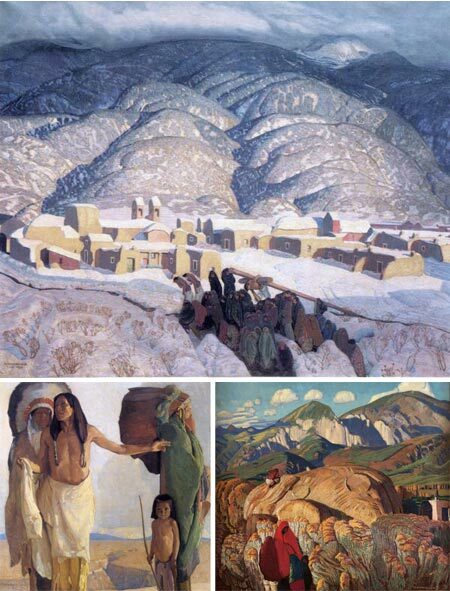 Ernest L. Blumenschein, an artist who was integral to the Taos Art Colony that flourished in New Mexico around the turn of the 20th century and instrumental in forming the style we now associate with Southwestern American art, was originally trained as a violinist at the Cincinnati College of Music. After taking an illustration class at the Cincinnati Art Academy, Blumenschein decided on a career as an illustrator in lieu of pursuing music, and moved to New York to study at the Art Students League. Convinced that he needed European training to excel as an artist, Blumenschein went on to study at the AdadÃ©mie Juilan in Paris. Word is that he played violin to put himself through art school, though I don’t know if that refers to New York or Paris. Though he enjoyed success an illustrator for popular magazines on his return, it was on trips to the American Southwest, one of which ended in Taos, New Mexico as the result of a broken wagon wheel, that he found his great inspiration as a painter; and he eventually returned to settle there, where he co-founded the Taos Society of Artists. He developed a style of landscape painting devoted to the characteristic land forms of the American Southwest, as well as finding subjects and inspiration in the Native American and Spanish American cultures that flourished in the area. Blumenschein’s paintings are founded in his training in classical realism, but carry the bright colors and fresh brush handling of Post-Impressionism, hints of Modernist geometry and some of the muscular feel of Thomas Hart Benton’s undulating Midwestern landscapes. The Phoenix Art Museum will host a major exhibition of Blumenschein’s work, In Contemporary Rhythm: The Art of Ernest L. Blumenschein, from March 15 to June 14, 2009. There is a new book accompanying the exhibit: In Contemporary Rhythm: The Art of Ernest L. Blumenschein. Ever since I received my remarkable Coraline Mystery Box, I’ve been simultaneously looking forward to the movie and lamenting the absence of a substantial cache of Coraline concept and production art. I finally got a chance to see the movie; which I’m happy to say lives up to my high expectations; and my wish for access to Coraline production art has been at least half answered. There is a book of production art; that is apparently disappointing in its limited scope; but a good deal of Coraline concept and production art has begun to appear on the web now that the film is in theaters. The Coraline movie is wonderful, in the semantic roots sense of that word. In particular I was delighted that it delivered on my expectations for beautifully realized visual texture. The level of detail, and the attention paid to the design and feel of the environments in this hand-animated gem is astonishing; and a refreshing antidote to the CGI slickness of much of Hollywood’s parade of computer animated features. After watching Meet the Robinsons through clunky 3-D glasses and getting tired of the effect about half way through, I was reluctant to watch Coraline that way, but I’m glad I did. The tasteful artistic approach applied throughout the movie has been carried over into the use of 3-D. After a few obligatory “poke you in the eye” (literally) demonstrations of the effect, it settled in as a way to add feeling and depth (in more ways than one) to the atmosphere of the story rather than being repeatedly intrusive as a gee-whiz gimmick. The story, animation skills, direction, voice characterization and overall realization of Coraline are superb, making it one of my favorite films (animated or otherwise) in recent years. The crew at LIAKA really delivered on the anticipation they generated with their remarkably creative promotional campaign of the Coraline Mystery Boxes. On the other hand, my hope for a great book of Coraline production art has apparently not been answered, at least not yet. I haven’t seen it myself, but according to reviews, Stephen Jones’ Coraline: A Visual Companion is disappointing both in its limited scope and the poor quality of the images it does feature. However, concept and production art images from the film have begun to appear on the web. Ward Jenkins, a regular contributor to Drawn! (see my previous posts on Drawn! ), has compiled an excellent article on some of the great concept artists who worked on the film, The Art of Coraline (from which I’ve taken many of the links provided below). In particular I was delighted with the evocative settings by Chris Appelhans (image at left, top; see my previous posts about Chris Appelhans) and the wonderful designs for plant life by Chris Turnham (image at left, second from top; see my previous post on Chris Turnham). Chris Turnham was apparently responsible for many of the beautiful plant designs in the amazing Coraline Production Art Scrapbook (click for larger images) that was the star item in my Coraline Mystery Box. In the wake of two other posts on crayons as an art medium, I came across the work of artist Christian Faur who, among his other work in oil, encaustics, fabric and fiber, uses wax crayons as a medium in a completely different way. Using hand cast encaustic crayons (that are still essentially similar to Crayola Crayons), Faur sets them into position, on end, in arrangements of the crayons themselves that, based on the value and hue of the individual crayons, forms an image when seen from a sufficient distance. This still recaptures some of the innocence and playfulness of childhood crayons and other toys (remember “Lite Brite”? 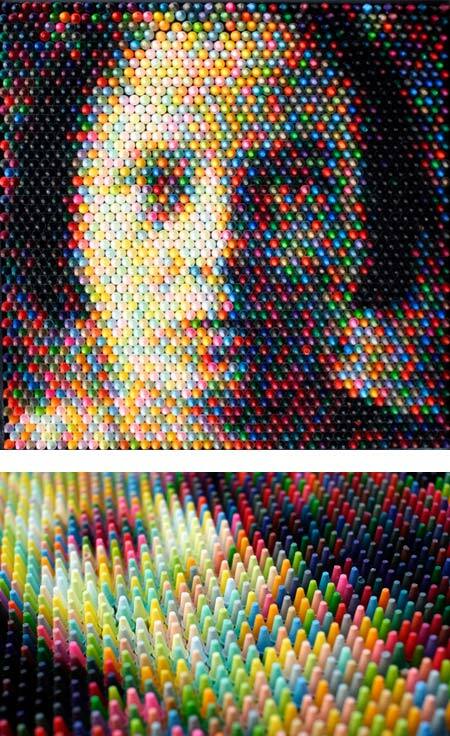 ), but uses the crayons as a combination assemblage and image creation medium. There are several experimental variations in which Faur explores the idea, many of them almost monochromatic except for sharp punctuations of brighter colors, others are full color like the image above, Experiment 5 (shown with a detail of the surface). One of his other artistic experiments involve assigning colored crayons as letters in a “Color Aalphabet” and then using them to interpret literary passages, for instance from Hamlet. He goes into detail here about how the colors were chosen. Minnesota artist Tiona Marco does landscapes, cityscapes, portraits, still life, wildlife and botanical drawings, all in her medium of choice, Crayola Crayons. That’s right, good ol’ big yellow box of ’em, wax in paper wrappers, wears down to a nub in your hands, drew with ’em when you were five, Crayola Crayons. She doesn’t add other mediums, melt the wax or otherwise manipulate them, she has simply become very adept at handling wax crayons as a medium. It was an email from Tiona, letting me know about her work, that prompted my post yesterday about Crayola Crayons as an art medium. Marco earned a degree from the Minneapolis College of Art and Design, and was teaching art to elementary school children in Mexico, where she had few resources for her own artistic endeavors, but access to plenty of crayons. She began to experiment with the potential of crayons to create art and on returning to the U.S. had a fortuitous encounter with Don Marco, an artist who had already mastered the use of Crayola Crayons as a medium. Don Marco took on Tiona as an apprentice and Tiona, on establishing herself as an artist, took on her mentor’s last name as her own professional name. 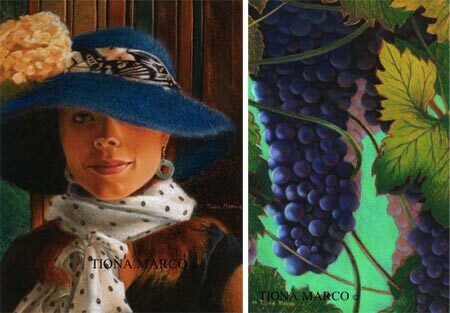 Tiona Marco’s web site has galleries of her work in several categories, along with a brief bio. Most of the works have links indicating if the original is available for purchase, and often offering prints as well. Many of the pieces are accompanied by comments. 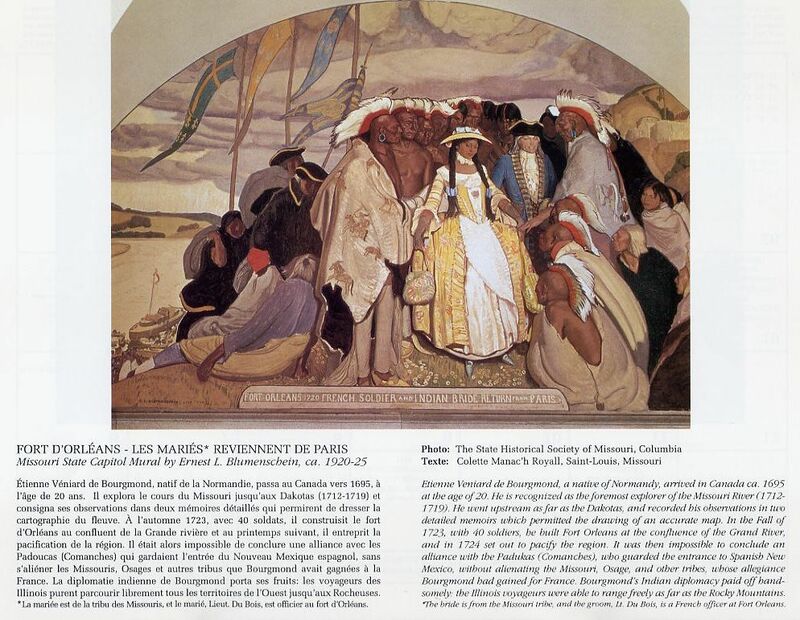 The image above, left, for example, is both part of a series of drawings of women in hats, and a nod to her fondness for the work of Vermeer. Marco also has a blog, in which she discusses how she got into wax crayons as a medium, and offers several videos in which she explains some of her techniques, as well as giving advice on how to care for an original done in wax crayons. 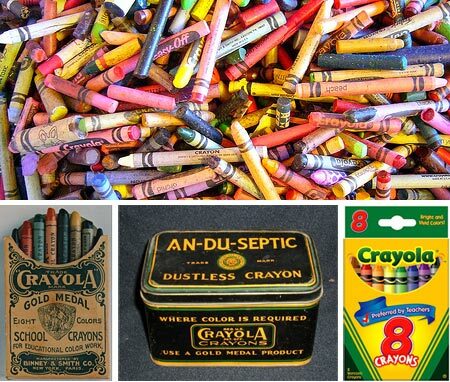 Ahhh, think about Crayola Crayons, those wonderful waxy knobs of color, wrapped in shreds of peeled paper, that for so may of us are integral to our first experiences in making art. Wax crayons are a fond symbol of childhood (and/or or child rearing) for many of us. That wonderful smell (is there a sweeter perfume?) can instantly transport us back in time; but how soon we leave our crayons behind, forgotten in the dusty toy boxes of our early youth. 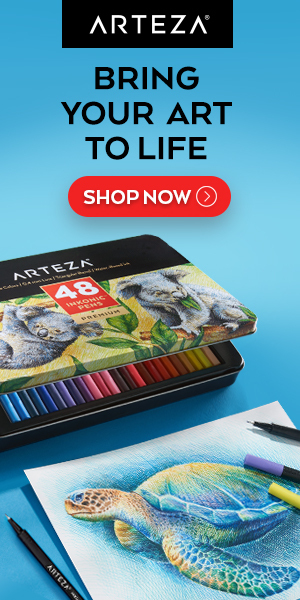 The thought of children’s wax crayons as a serious artistic medium would strike most artists as absurd. It’s simply “not done”; but, like many other mediums that are considered “inappropriate” by the arts establishment (ball-point pen for instance), they are the subject of narrow classification. Anything that makes marks on a surface can be a tool for visual art. Contemporary artists Don Marco and Tiona Marco (not related, but teacher and student) use Crayola Crayons as their primary medium. Though there are other manufacturers of wax crayons, like Rose Art and Dixon Ticonderoga (Prang), Crayola dominates both the market and the history of modern wax crayons. Wax crayons are not dissimilar to other colored drawing media — a pigment suspended in a binder; in this case, paraffin wax, a petroleum derivative. They are perhaps not intended to be as long lasting as other mediums (though wax has been useful as a binder for art materials for hundreds, if not thousands, of years), or to have as expensive or “pure” a pigment content; but as with any medium the important factor is the result achieved. The word “crayon” has other connotations in art, sometimes simply referring to a stick of almost any drawing material, but usually referring to chalks (“craie” is the French word for chalk). Chalk crayons were famously used by Baroque and Rococo artists like Peter Paul Rubens and Antione Watteau in the “aux trois crayons” method of drawing with black, red (sanguine) and white chalks on toned paper; a method particularly effective in figure drawing and portraiture (see my post on Sanguine Drawing). In particular we associate the term crayon with the chalks and graphite sticks in a gum binder created around the turn of the 18th Century by Nicholas Conté, and known as “Conté Crayons” (see my post on Pencils). Wax crayons may actually be more similar in their application to mediums like oil pastels, also called wax oil crayons, that are a combination of pigment, non-drying oil (as opposed to the drying oils used in oil paint) and a wax binder. Unlike oil pastels, which get a modicum of respect, wax crayons seem firmly relegated to the toy box instead of the paint box; but perhaps that’s an advantage. Maybe it’s a plus that they carry that connotation with them, and that picking one up immediately connects with that part of our past in which we were unrestricted by artistic convention, free to indulge in the playful whims that we lose touch with all too easily as adults. Did we ever feel “creatively blocked” as children playing with crayons? Hardly. Maybe we would all benefit from working, however briefly, with a medium that comes with a built in connection to the wide-eyed innocence and playful explorations of childhood. A box of eight is a little over a dollar and you can buy them just about anywhere (worth the price just for that wonderful smell). Zdzisław Beksiński was a Polish painter, sculptor and photographer known for his darkly dystopian fantastic realism. 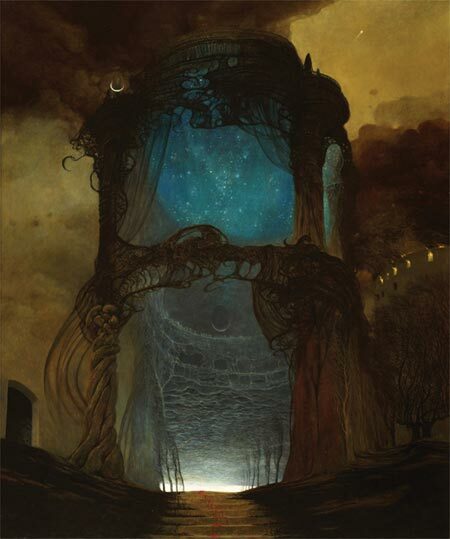 His intricately rendered images of other worldly or post-apocalyptic landscapes, often populated with deathly or skeletal figures, are heavily atmospheric, as if filled with a mist of miasma and corruption. He has a sequence of images of cathedrals dissolving into lattices of stone, disintegrating or floating into the air. Scenes of desolation and darkness, however, are sometimes punctuated with light and color, hints that perhaps all is not consumed by the dark, perhaps most dramatically so in the image above. The artist’s own life was marked by the darkness of personal tragedy. His wife died in 1998, when he was 69; a year later his son committed suicide and Beksiński was the one who came upon his body. The artist himself was murdered a few years later; stabbed to death by the teenaged son of his long time caretaker, to whom he had apparently refused a loan at one point. Beksiński studied architecture in Kraków, went to work as a site supervisor and outside of his job began to experiment with sculpture and photomontage. His initial efforts as a painter were in non-representational works, but he eventually moved into the vein for which he is best known, showing the influence of the Surrealists and Dadaists, as well as fantastic realists like Ernst Fuchs and H.R. Giger. In his later career, Beksiński became interested in digital photomontage, and you will often find examples of that work mixed in with his paintings. Beksiński’s art is still represented by his agent through the Belvedere Gallery and the official web site they maintain for his work.